Getting fit is a great way to meet new people and make great friends. After a grueling day at work, school or office, relieving the tension and stress from the day adds to a more positive self-esteem and a fit body. Individuals 16 and older may enroll in PE 218 and 219. High school students must receive permission from their guidance counselor and the credit is held in escrow until graduation. The credit may then be applied to college hours. Senior citizens receive waived tuition and pay only the lab fee. The fitness center is open when regular SCC classes are in session. Closed on Saturdays and Sundays. No children allowed. Must be enrolled in a weight training class (PE 218/PE219) to work out regularly. 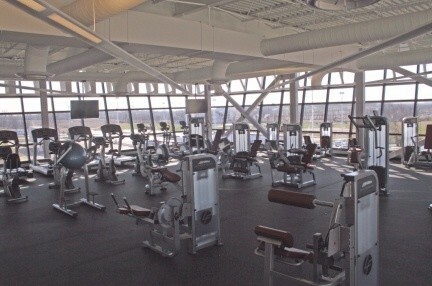 The Anna Center also sports a 2,000 square foot fitness center, equipped with the very latest in weight machines, ellipticals, bikes and treadmills. Whether your idea of exercise is a leisurely walk, a heart-pounding run or the smooth glide of an elliptical, those 40 inch LCD TVs and the overall décor at the Anna Extension Center will make your workout more enjoyable. 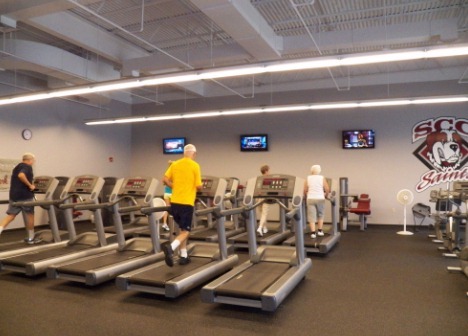 The fitness center is sure to attract students of all ages and fitness levels.